Little b’s milestones. This is like 4 weeks late. We were advised to feed lil b 2mls ofÂ Upthamol an hour before the scheduledÂ vaccines – Rotateg (oral) and 6 in 1 1st doseÂ (jab)Â for fear he may feel discomfort shortly after the jab. True enough, lil b developed a mild fever in the late afternoon so I fed him another dose of 2.5ml (now that he’s bigger)Â Upthamol. Besides spotting a fever, he was all his cheery self. No worries. - still being breastfed and on formula (4oz). 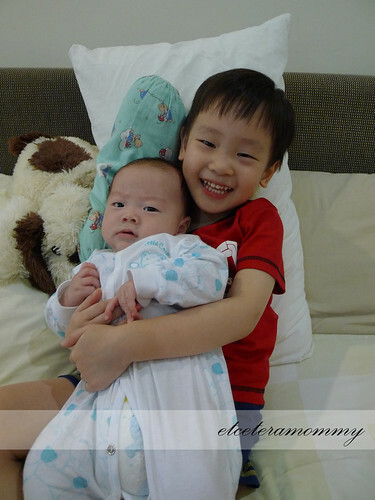 - lil b is able to lift head up briefly when on tummy.Â However, Â just like his kor kor, lil b dislikes tummy time. He would fuss each time I lay him on his tummy. - he started droolingÂ when he was about a month plus.Â These few weeksÂ he startedÂ blowing bubbles. At times, he blew so much bubbles until he chokes on his own saliva. - startles easily especially in the afternoon. That is why he is such a light sleeper. Eventhough I use a beanie on him, it doesn’t seem to help much. It’s just like walking on egg shells. - he’s able to follow object when we pass the item across his face. - he’s able to turn his head both sides. - I like to believe he’s able to recognise and love the sound of me because each time IÂ was nearby, he would readily attemptÂ to turn and look at me. - able to smile back when we make stupid funny facesÂ or smile at him. - able to respond by cooing when we talk to him. He can be really loud at that too. - enjoys the cot mobile a lot (unlike his kor kor who never appreciated them). - likes to stare at kor kor. - likes to kick and moves his hands alot. It’s as if he never stops moving when he’s awake. - last feed around 11pm, then 1am, 4am, 7am.Â On lucky days, he’ll doze off aroundÂ 9pm and wake up around 1am for his feeds, then 5am andÂ 8am. - doesn’t really have a fixed nap schedule yet. Usually he’ll go back to zzz-land after his 7am feed until about 11am. He’ll take another short nap in the afternoon around 3pm followed by 6pm nap. Really have work on a more preditableÂ routine so I could gain more sanity. Overall, lil b is a very cheery baby. Just like his kor kor, he seldom cry. I’m not even sure if I had heard him scream for attention.Â ButÂ on occasion whenÂ he does cry, he would purse his lips and his cries areÂ usuallyÂ accompanied by a lot of tears rolling downÂ the otherwiseÂ cheekyÂ cheeks. Daddy said lil b looked scared in the pic.Â Actually I believed he was kinda annoyed being jiggled around by kor kor who was evidently enjoying the opportunity to torture the lil bro. DaddyÂ has always been a F1 aficionado for as long as I can remember. RyanÂ must haveÂ inherited the thrill for fast cars from Daddy. Just the other day he told us he wants to become a doctor so he could earn lots of money to buy a Ferrari. It’s funnyÂ whenÂ I eventually found out he also said the same to his teacher at school, just a different version. 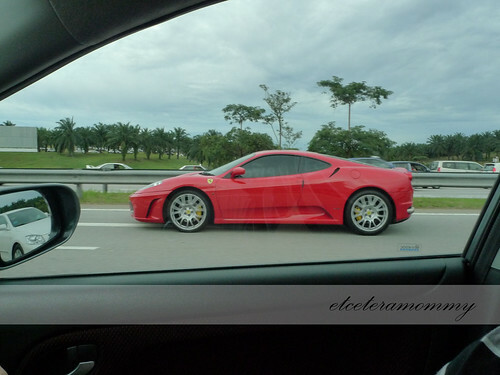 At school, he told his teacher this.. ” My mommy said I must go school to learn so I can buy a Ferrari”. Huh.. did I say that? I remember telling him doctors can earn a lot of money though .. mmm.. but then I also did say the same about singers, lawyers and yadda yadda. Just now I asked him again. Mommy: What do you want to become when you grow up? Mommy: No.. you can only choose one profession. Mommy: OK.. that’s good. What kind of doctor you want to become? There’s doctor who treats children, animals, …. Ryan: I want to become a doctorÂ who treats the aliens and monsters from outer space, and the sea creatures under water. Mommy: How about a doctor who treats human? Back to Formula 1. 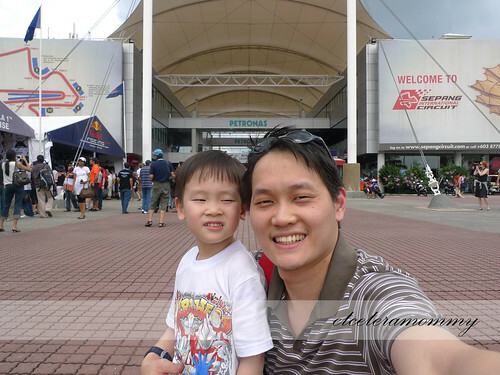 Daddy has gotten 2 grandstand tickets for this year’s Malaysia F1 Grand Prix, 2 – 4 April. 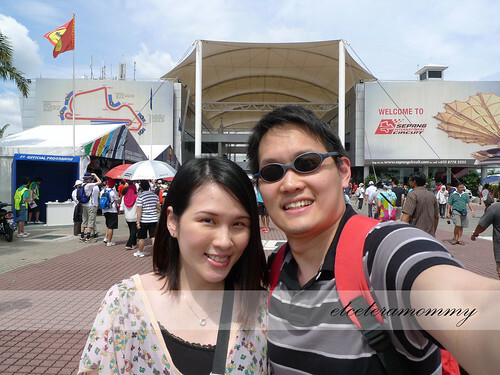 We didn’t miss the two races in Singapore but this time round I was quite hesitant to leave the kids at home, espÂ little B.
I told Daddy I’ll give it a miss but after much consideration and with my MIL’s blessing, I agreed to go for the race day and will give qualifying a pass. Knowing Ryan is also a fan of racing cars, we toyed with the idea of bringing him along. 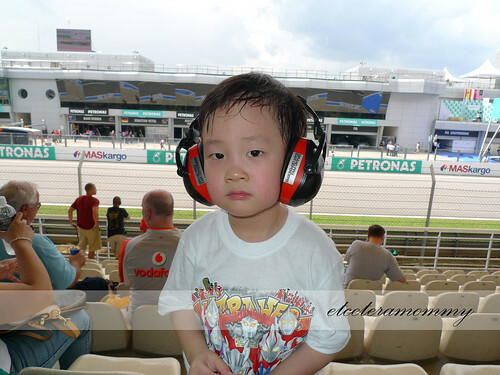 I remember how he would nag us to bring him along when he saw the lights and benches being setup during race period. As much as we wanted to, kids age 7 and below are prohibited from the race due to the noise level. Of course we could sign some indemnity andÂ purchase the earphone et al, but it’s really not worth the risk. 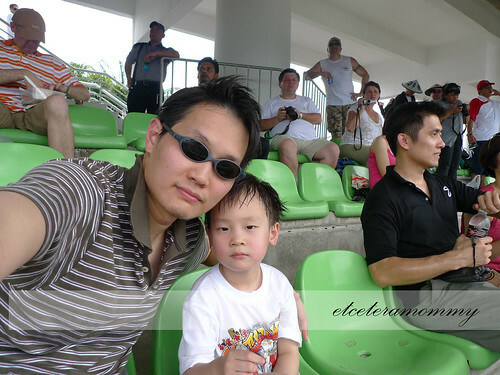 Since we have one spare ticket, Daddy decided to bring Ryan along for the qualifying race. We skipped the Friday practise session. 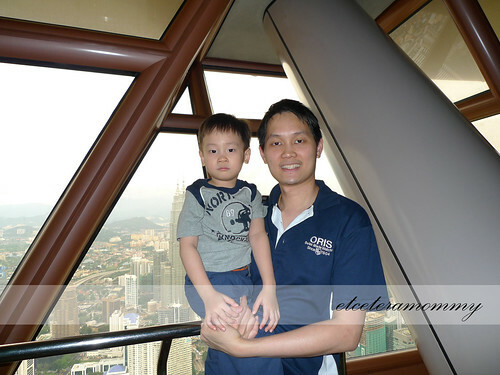 It’s not the first time the Daddy and son went out alone (the first time was when Daddy brought Ryan to the KL Tower back in February so I wasn’t too worried if Daddy could handle. Having said so, little did I expect 4 hours later, I saw father and son came home all drenched. 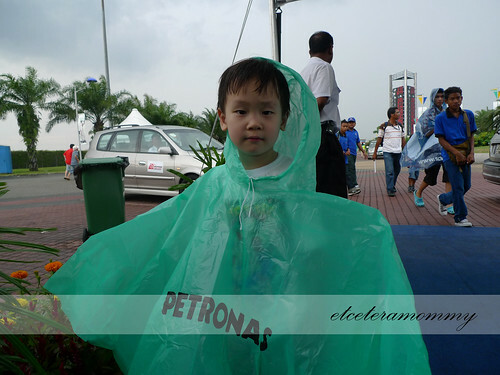 Daddy’s side of story was, apparently Ryan had insisted to go home and Daddy had to carry the 16kg boy to the parking lot 20 minutes away, all under heavy rain. I really don’t understand. Why can’t they wait for the rain to stop?Â Luckily Ryan had a raincoat on but heroic Daddy refused to wear one. ….. When I questioned Daddy, the ever good daddy said ‘BB wants to go home and how to carry BB with raincoat on, it’s slippery’. *chuckled* Silly nya excuse dia. Ryan likes tall nice building. 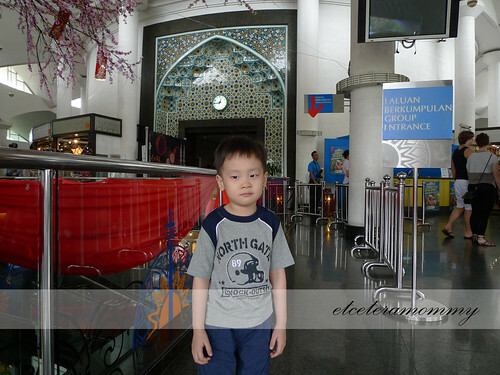 His fav building is the Telekom building along Federal Highway. Somehow he finds that fascinating. Notice the same smile? Thanks to Aunty Jane for the Ultraman tee. Ryan with the RM100 earphone. Super ex! Ryan with the Ninja raincoat. No wonder daddy refused to put on one. Day 2 Race Day. My total 7 hours break away from the kiddos. While the boys were out, I went to Ryan’s school alone for the teacher parent meet. I reached Ryan’s school at 1pm for the parents teacher meet. I spent about 30 – 45 minutes with his teacher discussing about Ryan’s overallÂ progress. Frankly I have no doubt about the school’s excellence in character building but so much cannot be said when it comes to academic.Â IÂ did not reserve myÂ bluntness and told the teacher frankly how the school failed my expectation. It’s frustrating to hear from Ryan all they did in school was play bubbles, sing songs, art and craft, stories,Â as compared to other kids his age are learning who are already catching up on writing, counting, phonics etc. I’m not trying to be overly competitive.. okay, maybe a littleÂ kiasu but I’m just being a realistic mommy. I’m not hoping to groom my kids into a genius with extraordinary achievements but I do have a set of realistic expectations that IÂ think allÂ preschool/kindergarten must achieve in terms of behavioural and academic. As much as I’m pleased with the behavioural improvement in RyanÂ since he attended this school (he’s more independent, more considerate when it comes to sharing), there must be a strike of balance on both enrichment. Unfortunately I’m not seeing that in Ryan’s current school. The most ironic thing was when I brought my concern up with the teacher, she totally agreed with me that the school’s focus is not academic. For examle. Ryan was already learning to write chinese ‘pi hua’ but in Ryan’s current school, they felt age 4 is too young to even hold a pencil.Â They will only learn proper writingÂ at age 5.Â She supported her point withÂ a piece of research article that emphasises children of age 6 and below should not practise writing. Children age 6 – 7 should not write (hold a pencil) for more than 5 minutes. All due to the hand’s bone structure. I was dumbfounded and simply, I just kept my silence. Anyway, Ryan’s overall feedback was good. He was above average and notably an all rounder. 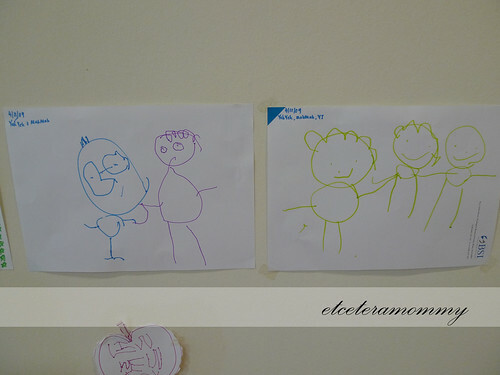 Teacher also commented there were occassions he imitated the Ultraman pose. When I heard that I bite my tongue trying hard not to laugh. Ryan does that atÂ home all the time so I’m not surprised he did the same in school.Â Before wrapping up, I told the teacher my concern on Ryan being overly competitive when it comes to play (the cannot lose attitude).Â Well, since the school received so much rave on character building, I guess I’ll give them the task to help me out on that. Teacher assured me she will look into that and help change Ryan’s mindset on winning and losing. We’ll see how it goes in the coming months but likely we’ll send Ryan to a different pre school next year if we want him to have a better foundation for P1. Ryan loves art and craft, particularlyÂ drawing. He alsoÂ likes to paint but he can draw better. 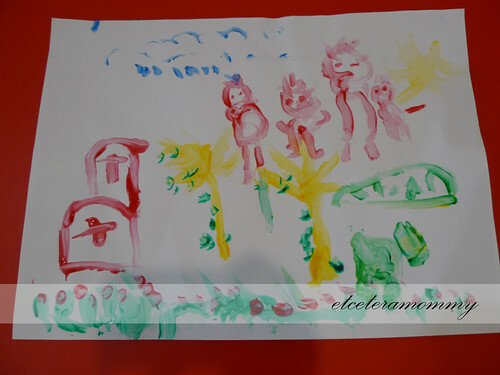 It isn’t state of the art painting but I thought that was really sweet…….. It definitely melts my heart knowing his family now includes lil b too. It was just like any usual day. 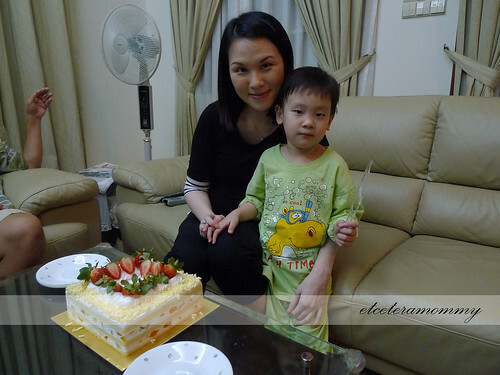 The initial plan was just to get a cake and have the cake cutting ceremony at home when Daddy comes home from work at night. Going out was never a plan I had in mind as it’s just too troublesome to go out these days with 1 tot and 1 baby on tow. However at about 2pm ish, I got an sms from Daddy. He said he had told MIL we’ll be going out for dinner and thatÂ she will help out with the babysitting. As usual, I was hesitant. I don’t know why I worry so much. I got chided by Daddy all the time for being overly protective and not being able to let go.Â He complained about me beingÂ always ‘lam’ everythingÂ up and not willing toÂ receive help. Mmm… thought of the day. Anyway, we went ahead with dinner plan. I met Daddy at Pavillion around 6.30pm after I sponged and changed lil b into his Pjs. Traffic was kind on me. It was smooth sailing until the Bukit Bintang junction. We went to TGIF for dinner. How boring right but I was kinda craving for ribs so.. TGIF it was. Daddy said we should let the staff know it was my birthday and get them to sing me the birthday song. Crazy. I definitely do not want the attention. I ordered ribs and Daddy just had salad. Immediately afterÂ eating, I told Daddy I want to go home.Â Before we left Pavillion, weÂ went to BreadTalk to buy my favourite cake, theÂ Chantilly. It’s super yummy! When we got home around 9pm, lil b was already asleepÂ therefor he did not join the celebration. 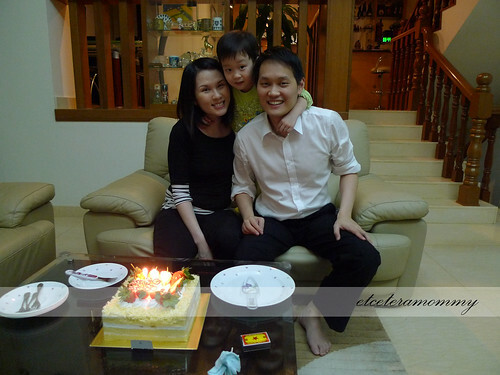 It was justÂ us, the tai lo and my in laws.Â Of course our helpers too esp Loida who share the same birthdate as me. Coincidence eh. Ryan loves the cake. Just a few days back I asked him if he was going to get me anything. He said “yes mommy.. I’ll get you a cake with a TV on it”. I wonder if I really did watchÂ that much TV till the extent my 4 year old wanted to get me a TV cake. LOL. How about Daddy? 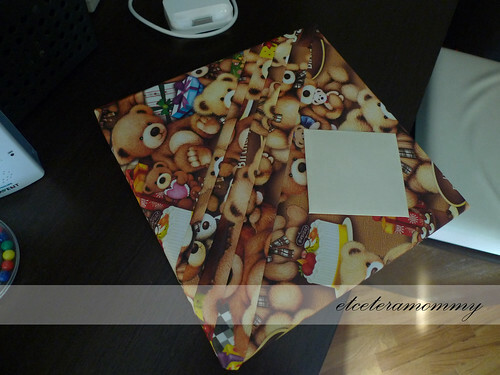 I received this from him…. It’s not something I would have expected but I bought his reasoning. Quite thoughtful of him.